CARLSBAD, Calif. -- Finding peace and quiet at a resort isn't as easy as one might think. Especially when the resort is the well known, bustling La Costa and you're on a golf vacation. The front nine on the Legends Course at La Costa keeps things interesting with changes from hole to hole. Golf stands at the center of it all here, been that way for generations. The huge lobby picture window off the grand staircase looks out onto both of La Costa's 18s. This reverence carries over into a fleet of golf carts that appears more plentiful than ships in the British Navy in its heyday. Groups are forever buzzing around those carts, loading and unloading, heading to and fro. There is often a shotgun start on the 18 open to the public that day. In the name of Ben Hogan -- whose picture hangs on the wall -- it's a whole lot of commotion. Which is what makes getting onto the front nine of La Costa's Legends Course such a welcome shift. A few holes in and you're suddenly going up hills and down valleys, almost lost in your own little golf world. This is the most under-appreciated stretch on the more under-appreciated of La Costa's two golf courses. When people talk about La Costa, they're usually focusing North. When they do think of the Legends Course, it is almost never the front nine, which doesn't have any holes included in the Accenture Match Play Championship tournament course (supposed to be the best meld of 18 from the 36 holes for the pros). No matter. 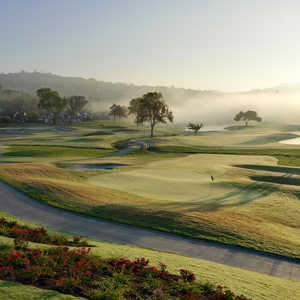 Form your own opinion and La Costa Legends' front nine is liable to capture your pleasure. The holes are a little more spread out. Everything's a little quieter. The challenges carry a little more substance. 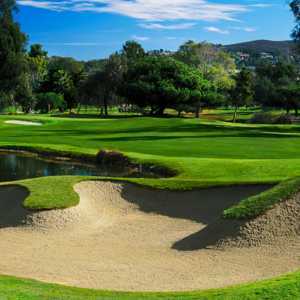 Golfers find themselves going from an uphill 467-yard par-4 with five bunkers flanking a tight green (No. 3) to a downhill 371-yard par-4 (No. 4) hugging a valley bottom. This is how your round plays out, up, down, fun all around. There is nothing overly dramatic or tricky about it. This opening nine simply allows you to try all the different clubs in your bag, matter-of-factly forces you to decide when you need one extra club and when you should go one club down. "I heard the North Course was the better of the two," Jim Orrcorcutt, a golfer from Cranbury, N.J., said. "But I don't know. This Legends one has its moments too." While there is nothing on the Legends Course worthy of the North's 13 through 18 stretch, it makes up anything it lacks in the spectacular with character. The front nine lets you get involved in the round, always keeps things interesting with changes from hole to hole. By the time golfers make the turn, they're ready for the longer (3,753 to 3,324 yards from the back tees), tighter second half. On this midwinter day, the rough is at PGA Tour-major-event level in preparation for the Accenture Match Play Championship Feb. 23-27, making the closing nine morph from tough to almost Pauly Shore frustrating. Still, it is easy to see how the stretch of 15 through 17 would be a test under any conditions. This trio usually plays into strong coastal winds, making the 384-yard, par-4 15th and the 428-yard, par-4 16th play like par 5s and the 575-yard, par-5 18th play like a par 6 (for a longer hitter). Adding to the arduous approach on 15, there are two gullies cutting all the way across the fairway. The second is close enough to the crammed-in green to make you think twice on your approach, yet far enough away to mess you up even more if you go conservative. No. 16 is simply a dogleg right with water to the right and the wind blowing straight in from the right. 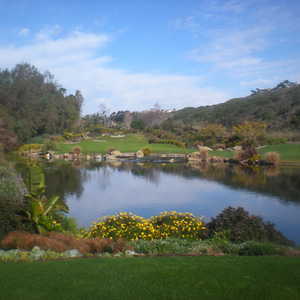 "I particularly like that 15, 16, 17 stretch," La Costa director of golf Jeff Minton said. "That whole nine, its length and smaller greens. And of course, the nice coastal wind." There's a masochist in every crowd. The last four holes were dubbed "the longest mile in golf" by the PGA players long ago and they now measure 1,847 yards from the back tees. La Costa Legends waits and waits to hit golfers with length, but when it does it's a whopping test. "I was having a great round until right around 15," San Franciscan golfer David Sills said afterward, still unsure what had hit him. "Then, it all sort of fell apart." Of course, saying you're having a great round through 14 at La Costa Legends is like the Bills declaring they had legendary seasons until those damn Super Bowl games. This is a course that builds up to the climax, lets golfers almost think it's going to be clear driving and then . suddenly you're hitting into Candlestick Park-worthy winds. This isn't the surprise for those in the golf know, however. The surprise comes in how the early buildup ends up being more satisfying than the grand finale. If you only have one day to play La Costa and the North Course is closed to the public that day, do not despair. The Legends Course is a worthy play in its own right, in terms of overall consistency maybe even a better play. The meandering front nine takes you away from the madness of the resort scene and then the back nine brings you into the fight of a trying challenge. This isn't a course that requires heroic clears or tricky saves. If you keep the ball straight and on target, you should do fine here. Of course, that is a big if with some of the narrowing fairways and tight greens, particularly on the back nine. If you're looking to be able to either take your time or speed around this 18, ask for a lull in the day's action when you're booking the tee time. Remember, La Costa is a very popular place and all those carts do get used. It is possible to get involved in some serious tee traffic jams here.